Our dental practice provides orthodontics for adolescents, teens and adults. If you feel self-conscious about your crooked teeth, or you find yourself covering your mouth when you smile or laugh, adult braces may be something to consider. Unlike the traditional braces for adolescents and teens, the options for braces straighten your teeth in approximately six months. 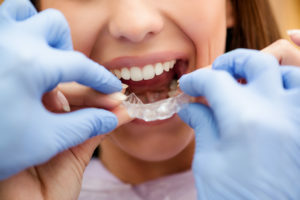 If you are interested in straighter teeth, a consultation with Dr. Eastburn will address the issues you have with your teeth, and help you determine which orthodontic treatment is right for you. You can expect treatment to begin with photos, x-rays and scanning or taking an impression of your teeth. Dr. Eastburn studied orthodontics at Louisiana State University Dental School, while he was enrolled in a general practice residency at the Veterans Hospital in New Orleans. He has also completed certification courses for Six Month Smiles, FASTBRACES and Clear Correct. Six Month Smiles clear braces offer straight teeth in less time – perfect for the adult who has always wanted straighter teeth. Six Month Smiles has taken the best aspects of metal braces and modified the treatment and the materials to offer common sense solutions for adolescents, teens and adults. Monthly payment plans make straighter teeth easier to afford. Another brand of orthodontics for adolescents, teens and adults, FASTBRACES Technologies use high performance bracket systems to speed up the process of straightening your teeth. FASTBRACES offer a solution for crowding of teeth, high canines, crossbite, overbite, underbite and more, generally in 6 months or less! While FASTBRACES involve clear or metal brackets, you don’t have to wear them nearly as long as traditional orthodontics..
ClearCorrect aligners straighten your teeth without metal braces. These clear alligners are nearly invisible, so most people won’t even notice you’re wearing them. Treatment can last from a few months to a few years, depending on your individual case. Most dental insurance plans do allow a certain amount for orthodontic treatment. Your insurance policy will spell out the details. You can generally pay for the remainder of your orthodontic treatment costs with your FSA or HSA that you have through your employer. We also offer financing, and accept credit card payments, check or cash. Call the Eastburn Dental office at 251-344-2126 today to schedule an orthodontics consultation.